Happy Valentine's Day! We have been having a wonderful time in Napa and will be heading to San Francisco today. 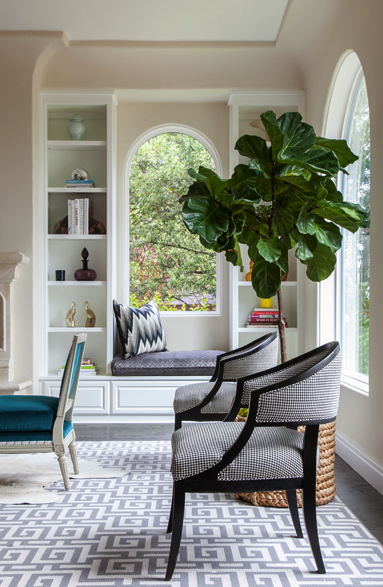 In honor of our trip, I wanted to feature an interior designer from the Bay Area today, so this beautiful living room was designed by my friend and fellow blogger and designer, Grant K. Gibson. I was immediately drawn in by the glamorous space featuring pretty jewel tones and gold accents against a neutral backdrop. While the more significantly sized pieces--the rug and sofa are grey, they are far from boring. The rug features a large-scaled Greek key pattern and the sofa has beautiful tufting detail. 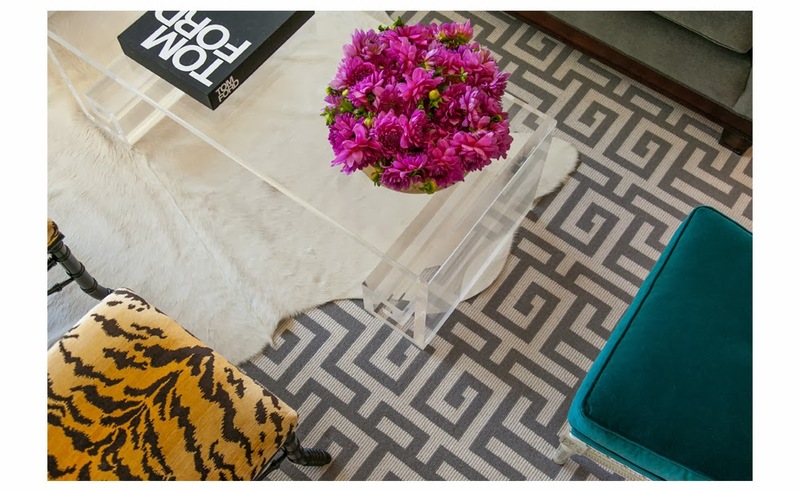 I love mixing bold patterns and infusing rooms with a pop of color, so my eye is also drawn to the beautiful, peacock blue slipper chairs and tiger print ottomans. This room is so stylish! I love the lamp, Lucite table, the blue chairs...everything works well together and it's gorgeous. Love everything about the room! Great mix of patterns and colors. Very elegant yet fresh! I agree, his scale pulls it all together. The tiny pattern on the chairs goes well with the large pattern of the rug. I love that so many of your photos show your obviously, very favorite and impressive book on Tom Ford ! I find that really funny. And on a serious note, I do love your posts very much. Love that lucite cocktail table and the animal prints!